There are many choices for a wedding theme, however a diamond or pearl wedding theme can make your wedding classy and elegant. Since diamonds can get a little expensive, consider substituting crystals. Diamond and pearl confetti and beads can be used to decorate your reception space and on the tables. One idea For your wedding centerpieces is to fill your flower vases with pearls or crystal (about 1/3 way depending on the size of the vases). You can even find small lights to put underneath the vases to create a glowing effect. 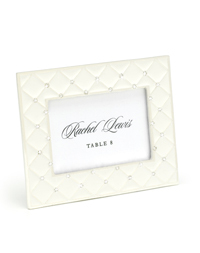 For place card holders, consider using something like the frames below. They definitely add a classy touch to your reception tables. A guest book for your guests to sign is a nice keepsake. There are pearl-lined guest book and pen sets thatwork well. Have pearls or crystals added your flowers arrangements and bouquets. Work with a florist for more ideas. If you are giving your bridesmaids a gift, consider giving them pearl necklaces, bracelets or earrings. Monogrammed crystal cake toppers can add elegance to your wedding cake. Swarovski makes several nice ones. A pearl-lined ring pillow would be perfect for your ring bearer. 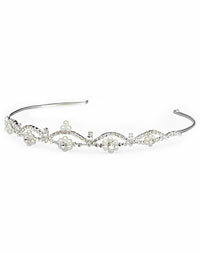 Many headpieces and veils have pearls and crystals in them, like the one shown below. Ice sculptures at your reception add class and definitely tie into your theme. For favors consider large, diamond paperweights. Or, get Organza bags accented with pearls, and fill them with candy. You can also tie off the bags with pearl accented ribbons.